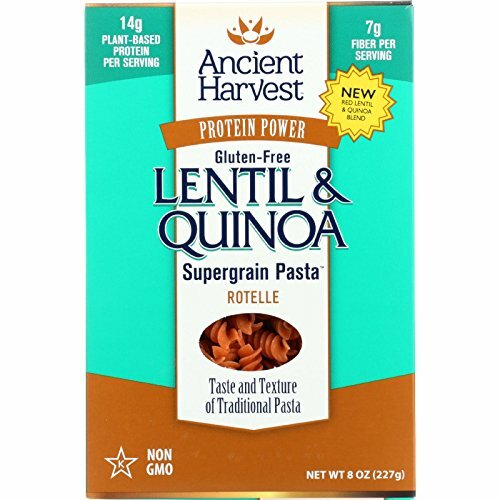 Introducing new protein-powered varieties of Ancient Harvest Supergrain Pasta made with a hearty blend of quinoa and beans or lentils. These naturally nutritious noodles tout the taste and texture of traditional pasta, but with 2X the protein and a healthy helping of fiber in every serving. It's no secret that we love nutrient-dense foods (we're pretty much obsessed with quinoa). So when our chefs combined two of the world's top superfoods into our Red Lentil & Quinoa Supergrain Pasta Rotelle, we knew we'd hit the jackpot. Every tempting bite is naturally gluten-free and has the taste and texture of traditional pasta, but with two times the protein power and a healthy helping of fiber to make these noodles the most nutritious thing on your plate. If you have any questions about this product by Ancient Harvest, contact us by completing and submitting the form below. If you are looking for a specif part number, please include it with your message.